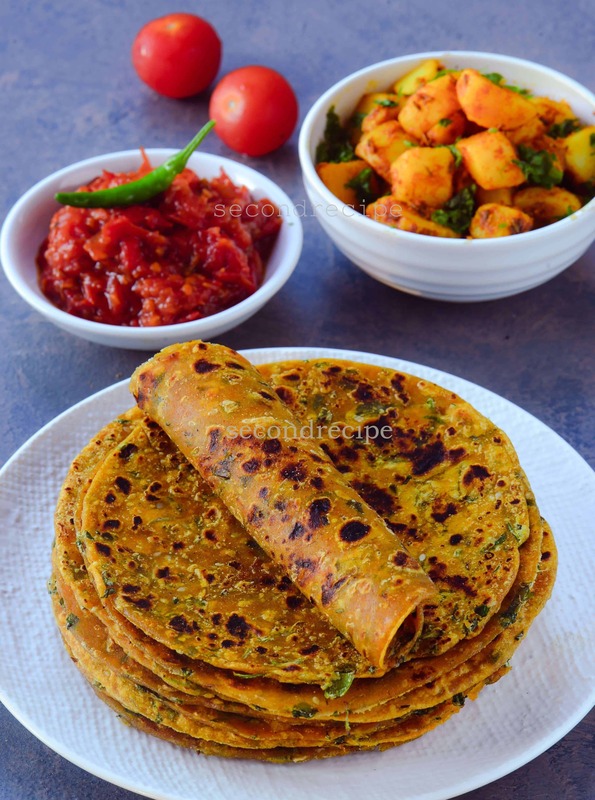 Methi thepla or fenugreek flatbread is a signature Gujarati dish.You can make it in advance on weekend.It serves you as a go to breakfast or snack whenever you are hungry instead of eating junk.It tastes great with chunda or any mango pickle or tomato chutney.You can also make them before travel and eat while you await reaching your destination.This helps you avoid market based oily food and also gives you good nutrition. This is a great way of adding methi/fenugreek leaves to your diet.Especially helpful for lactating mothers. Note:Please check with doctor before adding this to your diet during pregnancy. In a bowl, add all dry ingredients to wholemeal flour.Mix well. Add little oil to it. Knead a dough with little water to make a slightly soft dough.It should not be sticky. Take small amounts of dough a palm and make round size balls. Apply little oil on rolling pin so that dough does not stick while making thepla. Make thin flatbreads using rolling pin. Heat a non-stick pan,add little oil to it after placing the flatbread. Cook evenly on both sides by adding a 1/4 tsp oil after flipping over. Serve hot with mango pickle or tomato chutney and dry potato curry. Click here to watch more recipe videos.